CAN technology is used in the automotive, industrial automation and aerospace industries, in which OEMs and suppliers are confronted with many types of challenges. Vector supports you with professional tools, basic software and services. This E-Learning module is intended for all those who want to gain a better understanding of CAN communication technology. It is also ideal for all those who plan to participate in Vector training courses of the VectorAcademy. With the ISO11898-2: 2016 specification, the wake-up pattern for classic CAN and especially for CAN FD networks has been revised: The new wake-up Pattern is significantly more robust than its predecessor from ISO 11898-5: 2007. Our short article compares the wake-up patterns of the two ISO documents and describes how to create an appropriate wake-up pattern. "How to optimally disturb CAN (FD) networks with the new VH6501 interface"
Recorded February 21, 2018; duration approx. 45 min. "Flashing ECUs over CAN (FD), Ethernet, FlexRay or LIN with vFlash"
Recorded November 7, 2017; duration approx. 47 min. Recorded January 15, 2013; duration approx. 50 min. "High-speed reprogramming and calibration with CAN FD: A case study"
Speach by Peter Decker, Vector, at the 14th international CAN Conference in Paris, France; duration approx. 18 min. "Automated analysis for vehicle communication"
"CAN tools – then and now"
"Eye diagram analysis for CAN FD - Fast identification of poor signal quality"
"New communication paradigms in automotive networking - Ethernet and CAN FD are the new trailblazers"
"Secure communication for CAN FD"
"CAN FD: Fast measurement and reprogramming"
"CAN gets even better - Ways to transition from classic CAN to the improved CAN FD"
The clearly structured DIN A1 wall poster provides you with important technical details on the message structures of CAN and CAN FD. You are provided with the most important innovations with regard to ISO 11898-1:2015 in compressed form. If you would like to get detailed information on CAN/CAN FD just visit our "CAN Fundamentals" seminar. You will get a general introduction to serial bus systems in the motor vehicle and a basic knowledge of CAN (Controller Area Network). This includes the characteristics of the physical characteristics of a CAN network and knowledge about characteristics of the CAN/CAN FD protocol. Analyze all in-vehicle communications across bus and protocol boundaries and take advantage of functions for analyzing and stimulating CAN, but also LIN, FlexRay and more. Conduct remaining bus simulations across networks and test ECUs and entire networks using a single tool that offers functions for analyzing and stimulating CAN, but also LIN, FlexRay and more. The VN1600 interface family is an advanced development of the proven CANcaseXL product – a USB interface. While the VN1610/VN1611 offers 2 channels, and its focus is on lower size and weight, the VN1630A/VN1640A with 4 channels emphasizes flexibility as well as I/O support. Vector´s VT System is modular test hardware for efficient ECU tests and functional tests. Together with CANoe, the VT System represents a high-performance and flexible test solution. The MICROSAR.CAN package contains the basic software (BSW) modules defined in the AUTOSAR architecture for CAN communication and many useful enhancements. Furthermore it is suitable, for example, as a basis for calibration with XCP for gateways or for reprogramming. MICROSAR.CAN is part of MICROSAR – the embedded software for your AUTOSAR ECUs. OEM-specific embedded software for CAN communication in motor vehicles. The exact scope of functions is specified by the OEMs and is often based on the ISO, OSEK, or ASAM standards. Vector Controllers are ECUs for specific use cases with a focus on data communication. Whether charging communication (VC-VCCU), ethernet gateway (VC36B-12) or multi-gateway (VC121-12): Benefit from proven hardware already qualified for vehicle use. In addition to CAN, the Vector Controllers have numerous interfaces and features for successful prototype or serial use. With the Diagnostic Feature Set contained in CANoe, you analyze diagnostic communication according to the UDS or KWP2000 standard. CANoe can be used both as a diagnostic tester and for simulation of ECU diagnostics; ODX or CANdelaStudio description files are used for parameter assignment. A complete OBD-II Tester is also already integrated in CANoe. With the Diagnostic Feature Set contained in CANalyzer, you analyze the diagnostic communication according to the UDS or KWP2000 standard. CANalyzer can be used as a diagnostic tester for ECU diagnostics; ODX or CANdelaStudio description files are used for parameter assignment. A complete OBD-II Tester is also already integrated in CANalyzer. DiVA is a CANoe extension for automated testing of implemented diagnostic software in ECUs. Test cases are generated based on a diagnostic description. CANoe.DiVa is designed for use by the vehicle manufacturer and the supplier. Indigo is an easy-to-operate diagnostic tester that largely configures itself and masks the complexity of the diagnostic protocols. It provides a quick overview of the status of a vehicle and allows detailed diagnostics of individual ECUs. A large number of applications from the vehicle and ECU diagnostics are directly mapped by Indigo. Diagnostic tasks are conveniently handled with a minimum number of user interactions. MICROSAR.DIAG is part of MICROSAR – the embedded software for your AUTOSAR ECUs. CANdesc (diagnostic embedded software component) is used to implement the aspects of the diagnostics that are independent of the function and hardware of the ECU. CANdesc enables both the vehicle manufacturer and the ECU manufacturer to implement a uniform, cross-product diagnostic protocol for different type series and vehicle manufacturers. vFlash is an easy-to-operate tool for programming one or more ECUs via CAN/CAN FD, LIN, FlexRay and DoIP. The primary application area of CANape is optimizing the parameter set (calibration) of ECUs. 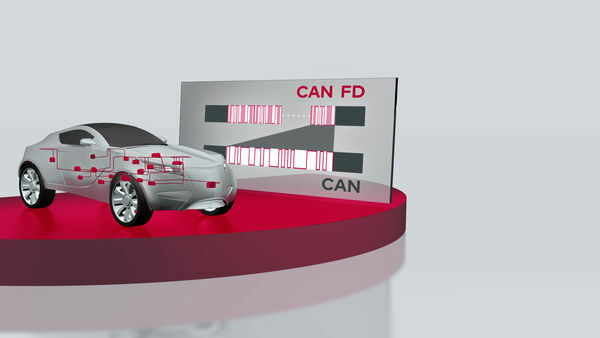 The communication between CANape and the ECUs takes place via protocols such as XCP or via microcontroller-specific interfaces with the VX1000 hardware. CANape and VX1000 enable measuring, calibrating, and flashing via XCP with a high data throughput and minimum runtime influencing of the ECU. The Vector Flash Bootloader is a uniform solution for reprogramming of ECUs during development and during production and service. It conforms to the specifications of the respective manufacturer and is coordinated and further developed with this manufacturer on a continuous basis. This special run mode for CAPL network nodes enables time- and performance-critical simulation models to be run directly "on-board" on the network interface. User interface and simulation part are isolated from each other. For this reason other PC tasks, such as compiling, virus checking, Outlook, etc., do not adversely affect the bus simulation and measurement. System configurations can be easily scaled based on user-defined requirements, e.g. monitoring, soft real-time simulation, real-time simulation. The same model can be run both in a real-time environment and in a conventional environment. The model can be run in the real-time environment with higher accuracy and lower jitter and is thus more deterministic. The workflow is the same as the standard CANoe workflow. CANape and VX1000 for measuring, calibrating, and flashing via XCP with a high data throughput and minimum runtime influencing of the ECU. A complete solution for bypassing is available by interlinking CANape, VN8900 and the VX1000 measurement and calibration hardware. The VN8900 network interface serves as the computational platform here, and the VX1000 System assures a high-performance measurement and calibration connection to the ECU. In CANape, the overall solution is configured, and the signals and parameters are visualized. 2019-06-03 Webinar: CANoe/CANalyzer 12.0 - What is new?